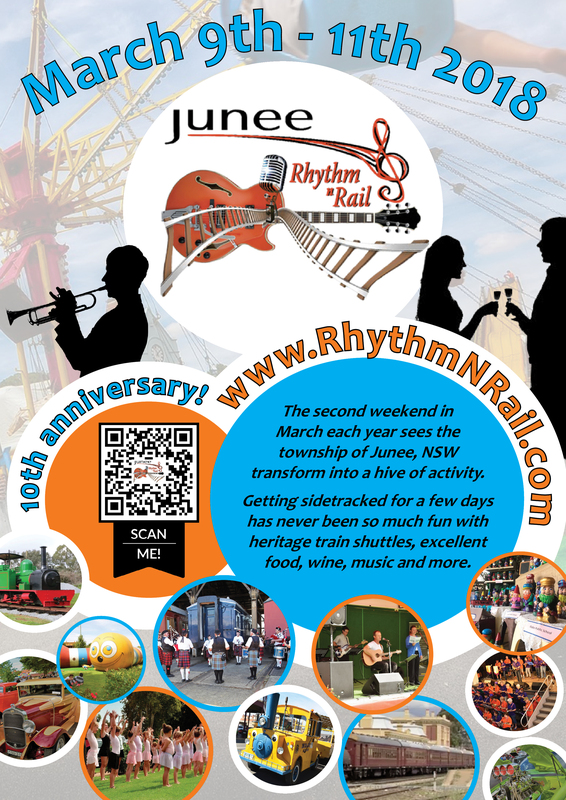 The new poster promoting the 2018 Junee Rhythm n Rail Festival has been released and you’ll start seeing it all about Junee, and in surrounding towns, over the next week or so. If you’re a local business or organisation and you’d be willing to display an A3-sized poster in your shop window or somewhere prominent, please use our Contact Form and select General Enquires and provide us your address and we’ll drop one into you. A limited number of copies of the A3 poster will also be available for collection, later this week, from the Junee Visitor Information Centre (located within the Broadway Museum on Broadway). Alternatively, you can click on the Poster images to download an A4 sized PDF ready to print at home or work and then post them at various venues and locations you visit. We also have a “print ready” version of the Poster that can be inserted in to newsletters and magazine. If you’d like a copy to include in your club magazine or newsletter, just drop us a line, using the Contact Form as mentioned above. The poster includes a QR Code that can easily be scanned using a Smartphone Camera. Scanning the QR code will take you to the RhythmNRail.com website. Users of iPhones and iPads running iOS 11 or later can scan using the built-in camera app — no additional software is needed. Just open the Camera and point at the QR Code. You’ll then be prompted if you wish to open the URL. Android 2.3.3 or later supports scanning of QR Codes. If you need a QR Code Reader for your Android phone or tablet, you can download QR Code Reader.